Before we get to the 2013 Ford Explorer review, we've got a fun factoid for you: Did you know that the Explorer's new design happened in part due to Latin dance? That's right, Latin dance. As it turns out, Design Manager Melvin Betancourt has strong roots in Spanish Harlem, NYC, and the music of his heritage inspired part of the Explorer's design. He claims the new design is "...ripped and toned, athletic and graceful." This is, of course, quite similar to the body of a dancer. All somewhat odd allusions aside, the next-gen Ford Explorer really is an athletic, yet graceful mid-size SUV. Ford Explorer shoppers in Dallas will love its contoured lines, aggressive fascia and commanding presence. And with best-in-class fuel-efficient engine options like an EcoBoost engine and sporty options like a turbocharged 4-cylinder good for 365 horsepower, the driving experience you crave is completely up to you. Beyond its great looks and myriad engine options, the Explorer is one of the highest rated vehicles on the road when it comes to safety. In both government crash tests and IIHS safety testing, it scored top marks. 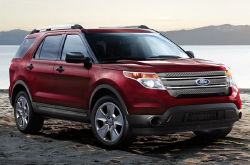 But that's not all the Ford Explorer offers Dallas-area shoppers: Read on for a full review of the 2013 Explorer. When comparing the 2013 Ford Explorer head-to-head with the 2013 Chevrolet Traverse, Dodge Durango, Jeep Grand Cherokee, Buick Enclave and the Mazda CX-9, and you'll notice that the Explorer outperforms those autos in quite a few aspects. Get a load of just a few of the reasons below. 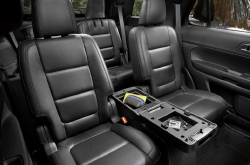 Take a peek inside the 2013 Explorer - view video now! No aftermarket car repair sites in Grapevine, TX offer Grapevine Ford's exceptional combination of certified Ford Explorer service techs, 12-month long warranties on all services and Ford OEM parts. Even the quality Fords in Grapevine can take a walloping, so turn to the Ford service and autp repair buffs in Grapevine at Grapevine Ford. Whether you're hunting for cheap electronics repair or less tedious work like tire alignment and replacement or speedy oil changes, we'll take care of it! And these things are just a chunk of the services we do. Grapevine Ford is your number-one choice in Grapevine for quality, professional Ford repairs and routine maintenance. The link at bottom is your key to savings! Click now and you'll be linked to our coupon specials page! Critics and drivers alike agree that the 2013 Ford Explorer is one of the top choices in the competitive mid-size SUV segment. Other vehicles like the Chevy Traverse, Mazda CX-9 and Dodge Durango can't compete with the Explorer's overall level of quality and refinement, nor can they match the fuel efficiency of its EcoBoost engine option. Adventure and excitement (and maybe a little Latin dance music) are never far away for Ford Explorer drivers in Dallas! Grapevine Ford encourages you to contact them to arrange a test drive in the classy, yet rugged 2013 Explorer. Choose from attractive exterior colors like White Platinum Metallic Tri-Coat, Tuxedo Black Metallic, Green Gem Metallic, Ruby Red Metallic Tinted Clearcoat and so many more. For more information on the Ford Explorer from Grapevine Ford, contact them today. Fill out the inquiry form on the upper right-hand side of the page or call using the number at the top of your screen. One of their knowledgeable representatives will be happy to provide you with the information you need to make an informed decision on your next purchase.